Exteme peformance storage leader, Violin Systems announcement and insights. Customers demand consistent extreme performance in their data centers today. Among the highest concern are the mission critical applications that remain on premise and where the slightest amount of latency means hundreds of millions of dollars a day for businesses. As companies implement technology to provide this consistent extreme performance, they are also realizing that improved performance provides more insight to allow for making better decisions while reducing the operating cost of their core revenue generating systems. Join us and hear how our customers are realizing the benefits of consistent extreme performance. StorageReview.com is the industry’s leading provider of unbiased enterprise IT reviews. Recently StorageReview.com awarded the FSP 7650 with their Editor’s Choice Award, just the third issued in 2018. In this webinar the StorageReview team details the paces they put the system through and highlights both application performance results including database workloads for SQL Server and Oracle as well as a look at standard four corners tests. Key highlights include easily hitting over 7GB/s read and offering random throughput in excess 1.6M IOPs. A short white board introduction to the Flash Storage Platform (FSP) from Violin. Violin, the disruptive innovator in Extreme Performance Storage, is revolutionizing how businesses operate by enabling storage technology to be Instrumental to their company by changing the SLAs and capabilities of information and application storage infrastructure. 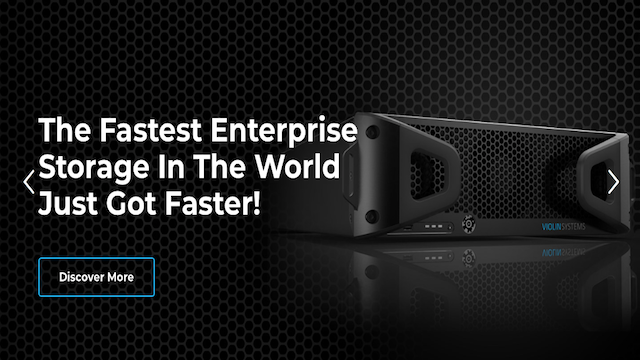 The Flash Storage Platform™, powered by Concerto OS™, a fully integrated storage operating system, is the industry leader in the combination of every significant category measured in all flash arrays: low latency, reliability, affordability, density, scalability and of course extreme performance. With tightly integrated data services, the Violin Flash Storage Platform provides a unique and leading combination of data protection, business continuity, and data reduction services in a flexible, uniquely scalable solution called ScaleSmart™, delivering significant CAPEX and OPEX savings. Founded in 2005, Violin is headquartered in San Jose, California. Title: Something Extreme is Coming!